Commemorating the Battle of the Coral Sea Robert Taylor has chosen to portray the sinking of the Shoho in this dramatic painting. When Commander Weldon Hamilton, leading one of the Lexington's Dauntless squadrons, spotted the Shoho at 1040 on the morning of May 4th 1942, the Japanese carrier's fate was sealed. Within minutes she was hit by the full force of the Lexington's dive bombers and torpedo aircraft, aided by the Yorktown's attack group. Smothered by a dozen bomb and seven torpedo hits, she was sunk within thirty minutes of the first sighting. 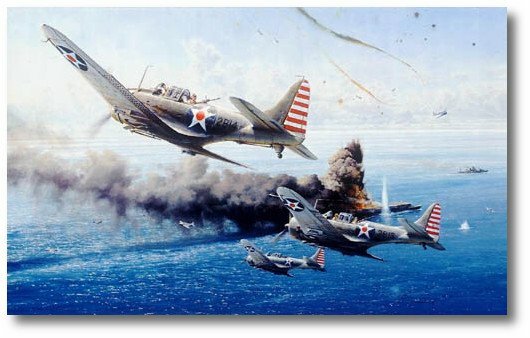 Each print is individually signed by the artist and SBD Dauntless pilots.